You've worn your jeans above the belly button and slung low around the hips, but there's a new waistline you may just be tempted to try: Meet the dip. Opening Ceremony just debuted a modern twist on '90s high-waisted jeans that are mid-rise in the front but high-rise from the back. Since the straight-leg style sits high on the hips, it accentuates your waist at its narrowest, creating a slimming effect. So what’s the best way to wear the dip? To make the most of the jeans, style them with a fitted top that has a slight crop. A tighter top will help the relaxed bottoms from feeling too loose. Then, if you still want a little extra coverage, add a robe coat to finish off the look. The ensemble has the feeling of a model-off-duty look, no catwalk required. Take a closer look at the jeans below, then pick them up for yourself! 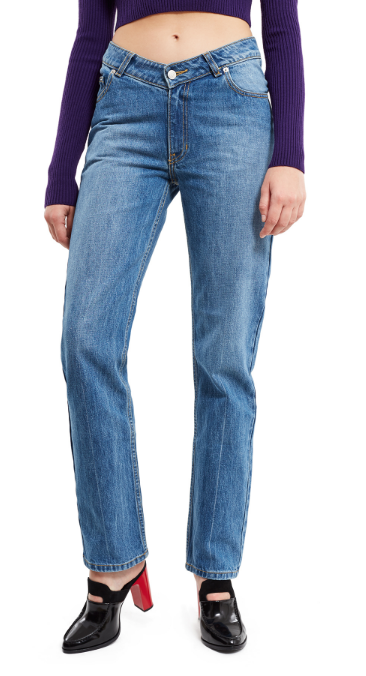 From the front, the dip jeans are mid-rise, with the zipper lower than the hips. From the back, the jeans have a high-rise fit and feature the brand's logo. Would you wear dip jeans? Let us know in the comments!